Appreciate all the info in this thread and just sharing some measurements and total weight figures from my recent corner balance. Last edited by Azeka1; 03-15-2019 at 08:50 AM. That's with rollbar, rear and front Stb (back one is heavy) big battery in the boot, (11lbs one on the way) and door cards in place. Lol and full fuel. so half tank would be minus 20 kgs or so. if I take -33 lbs for the huge batt for brallie swap out.. (I also have the 15lbs one) installed a week or 2 ago. 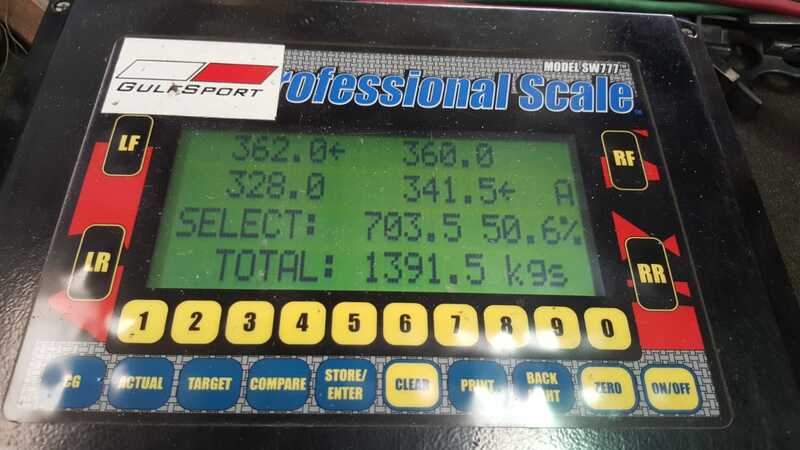 33/2.2= -15kgs.. would bring mine to 1376 kgs.. that's 3027 lbs. Intrested in how you installed the new batt, I umed and arred a long time before finally placing the new batt and its holder. i /did/ however pull the whole radio/nav thing bit out though..
2007 EuroSpec Z4///MC DIY Arial. Carma FF race exhaust. Cust. D///MK 6 Speed ultra SSK. CDV X. CSL 19" Rims. Apex 75mm kit. Stoptech brake lines. APR Aero. CSL intake. Epic Alpha-N. KW CS. SS sec1. 288/280. ECS power pulleys. Tillet B6Fxl. Sabelt.Varis. Brembo GT. ME STB. JB/Sachs Race SMFW . Last edited by Vanne; 03-15-2019 at 08:01 AM. As a point of clarification, my corner weights include a 150lb ballast for driver (Will update my post). With regards to the Braille Battery, I used a Macht Schnell mount for E92, fits perfectly. every time I reduce weight, seems to be from the rear. There is more I can remove, but I don't want to make the front/rear balance worse. Planning a cage soon, 40lb more to the rear I guess.